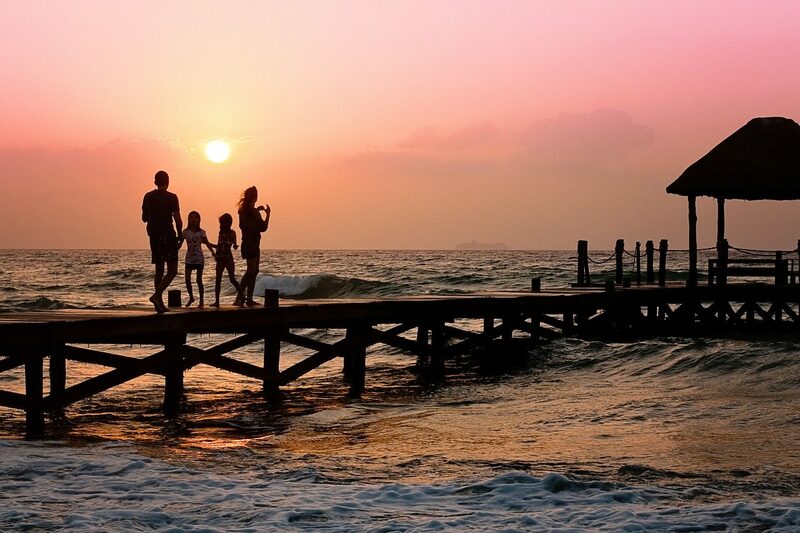 Spring break is the perfect opportunity for a family holiday. The kids have some time off school and the weather is nice in many destinations around the world, giving you a wealth of options to choose from. On a family spring break, you can make wonderful memories that will last a lifetime. Enjoy a great Mexican beach vacation on the Riviera Maya. Just south of the party-friendly Cancun, the Riviera Maya is a more family-friendly area full of great resorts and lots of family fun. When seeking places to stay, don’t miss some of the fantastic all-inclusive resorts like the Grandes Velas Riviera Maya. This luxurious hotel features kid group activities, care for babies, a teens’ club and also offers cribs and other amenities that make it a great family vacation spot. Do you have horse lovers in your family? Treat them with a full western ranch experience at this amazing resort. There’s plenty to do here, from horseback riding to swimming, hiking, birdwatching, cookouts, hay rides, ATV and jeep tours, and more! Mom and Dad can take a break with a visit to the spa for a massage a round of golf or a game of tennis while the kids are busy at the Caballero Kids program or being cared for by a babysitter. On this spring break holiday, everyone is sure to have fun! If you’re not looking for a sunny, warm destination, perhaps you’d like to ski! Springtime is still ideal for a snowy getaway in many areas of the country, including Colorado. Steamboat Springs is a great choice for a family vacation as it features the Kids Vacation Center, where kids can learn to ski and snowboard with dedicated instructors. In addition to hitting the slopes, the family can enjoy other adventures such as a visit to the hot springs, horseback riding, snowmobile tours, scenic gondola rides, hot air balloon tours and more! Head to the Caribbean to this all-inclusive, family-friendly resort that will keep your family happy throughout your spring break. Featuring age appropriate activities for kids from 4 months to 17 years old, you can make sure your children will have just as much fun as you will. The beach, swimming, golf and range of other sports and more will keep you busy and entertained while staying here. This enchanting town nestled in the Smoky mountains is a great choice for a holiday filled with family fun. Closeby to the Great Smoky Mountains National park, you can get your fill of nature and wildlife. In addition, the town features nearby attractions such as an aquarium, water park, museums and a fantastic amusement park. Head to South Carolina for great beaches and family fun on Hilton Head Island. Featuring child-friendly museums such as “The Sandbox”, horseback riding, playgrounds, bike riding, and of course, the beach, you’ll stay busy while on vacation. There are a number of resorts featuring kids’ activities, so pick your favorite and book your trip. Head to the lost city of Atlantis for a one-of-a-kind family vacation you’ll never forget. See the dolphins at Dolphin Cay, enjoy the pool or head out for a round of golf while the kids enjoy age-appropriate activities on site. The city of San Diego is the perfect family destination to enjoy over spring break. The town is full of some of the best kid-friendly attractions in the country. In addition to the closeby beach, you can visit the famous San Diego Zoo, a variety of museums, Disneyland and Legoland, all of which are within short driving distance. This stellar national park is full of waterfalls, nature and unmatched scenery. Stay close to the park at the Tenaya Lodge which will give you easy access to Yosemite while also offering nearby attractions and kid-friendly activities. Sign them up for archery, horseback riding, take a ride on a vintage logging steam train or simply enjoy a dip in the pool. Childcare is available if you want to take off and enjoy some adult-only time. Enjoy this majestic park as part of a family holiday that will give you many memories. From rustic camping to lodges including the family-friendly Yavapai Lodge, there are a number of options for staying within the park. Your family will be sure to enjoy this gorgeous destination where you can enjoy not only the views, but partake in biking, river adventures and ride the Grand Canyon Railway. Make memories that will last a lifetime by taking advantage of spring break for a family vacation! When planning your family’s spring break holiday, make sure to make use Picniic ‘s many features that are ideal for taking care of your family while traveling. For example, store important medical records such as immunizations, allergy information and more in the info locker. Although no one wants to imagine the worst, having this information handy could be very important in case of an emergency. You can also share photos from your vacation on the Family Photos section of Picniic; like an album for the whole family to access. During the planning stages, you can make use of to-do lists to make bookings or speak with your travel planner. In addition, you can help organize packing lists for each family member using Picniic so that your kids won’t forget essentials. Are you ready to pack your bags? Start planning your 2018 family spring break today!